If there is a meal that everyone associated with Christmas dinner, this is undoubtedly the Christmas turkey. Today we will prepare a traditional recipe I assure you have an unbeatable flavor and juicy turkey is tender and well. Surely you remember a few days ago I showed you useful tips for balanced menu this Christmas. On Christmas recipe that we use today, it is not necessary cooking accessories like many in the American and also the filling is actually inside the turkey, not cooked separately. 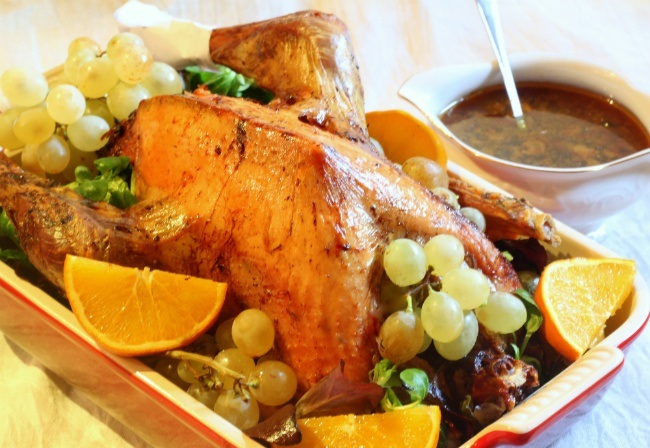 A 4-5 kg ​​turkey, (better if leaving most tender turkey), lard, salt, onion and 50 ml of sweet wine. For the filling, 300 gr of bacon, 1 apple, 4 slices of stale bread, dried apricots, prunes and a glass of chicken stock. While cleaning begin turkey, removing tweezers and feather canyons that have not removed the smuggler, and scorching with a torch or a match, which are small to “shave”. After injected with a syringe 50 ml of sweet wine in different parts of the breast and legs to make it very juicy. Once clean and after the injections, salted inside and out and spread with a little lard. Let preheating the oven to 220 degrees and while preparing the filling. To do rehydrate prunes and apricots and cut into pieces. The bacon fresh the chop into small pieces and put it with the remaining ingredients in a bowl, soak the bread with the broth. Once all mixed, add the cut into wedges and fill the turkey apples. Ideally, sew the opening with kitchen string so that the stuffing does not escape during baking. Regarding the baking time, they are calculated every 45 minutes kg turkey. In my case I had to have it 3.20 minutes at 180 degrees. One trick to avoid burning and excessive drying out is that when you take a half hour in the oven, you can cover the breast with a sheet of aluminum foil like the tips of the thighs. After separating the legs, breasts cut the Christmas turkey done in the traditional way sliced ​​and handed out to the guests, serving over sauce that will have been in a gravy boat. To each we put the grapes and lettuce garnish of your choice. Merry Christmas to all!